Meanwhile, Robert Pattinson and Zac Efron are among those named as potential candidates to play the role of star striker Jamie Vardy. LEICESTER CITY’S RISE from the bottom to the top of the Premier League has caught the imagination of millions across the world in one of the greatest and most romantic stories sport has ever seen. Such is the drama and surprise behind The Foxes’ remarkable feat that the talk of a Hollywood film being made to tell their story is increasingly being discussed. 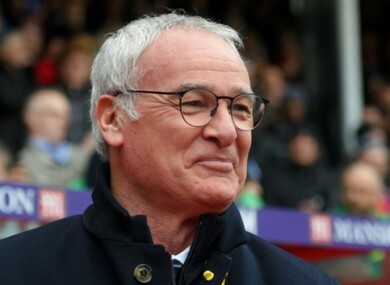 With Robert Pattinson and Zac Efron among those named as potential candidates to play the role of star striker Jamie Vardy and Vinnie Jones seen as the man capable of playing former manager Nigel Pearson, it seems Claudio Ranieri has already picked the actor he wants to convey him. Having played iconic characters such as a young Vito Corleone in The Godfather Part II, Travis Bickle in Taxi Driver, Jake La Motta in Raging Bull and James Conway in Goodfellas, Robert De Niro has been seen as the man to take on the role of a lifetime and feature as the 64-year-old Italian. And that prospect is one which intrigues Ranieri himself, who was asked about the idea on Friday. Any talk of a film on Leicester’s miraculous season could come to a halt if they fail to lift the Premier League title this season. That is becoming increasingly unlikely, though, as they remain seven points clear at the top of the table with five games left to go. Leicester take on West Ham in Sunday’s match, and second-placed Tottenham face Stoke City on Monday. Email “'Robert De Niro can play me in Hollywood film'”. Feedback on “'Robert De Niro can play me in Hollywood film'”.